By dougjq in entrepreneurship, management on 2017 April 29 . Starting 18 months ago, I began more detailed timetracking for MassLandlords, which is a bootstrapped startup. I started noting the difference between what Andrew Grove called “high leverage” activities and what Pratt and Whitney called “individual contributor” activities. This is the first time I’ve made a graph of the results. It’s a prime example of “what you don’t measure doesn’t get better.” It shows that I haven’t been unburying myself the way I imagined. Leveraged management time vs individual contributor time in a bootstrapped startup. Each point is a ten-period moving average of a 4-day interval. Graph shows level of effort for the MassLandlords project. 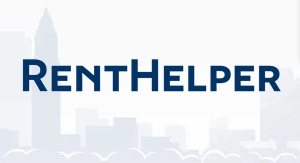 The blue portion represents time spent doing “leveraged management.” The idea is that one or two hours spent with a direct report, employee, or contractor will enable them to do eight or more hours of work on their own. 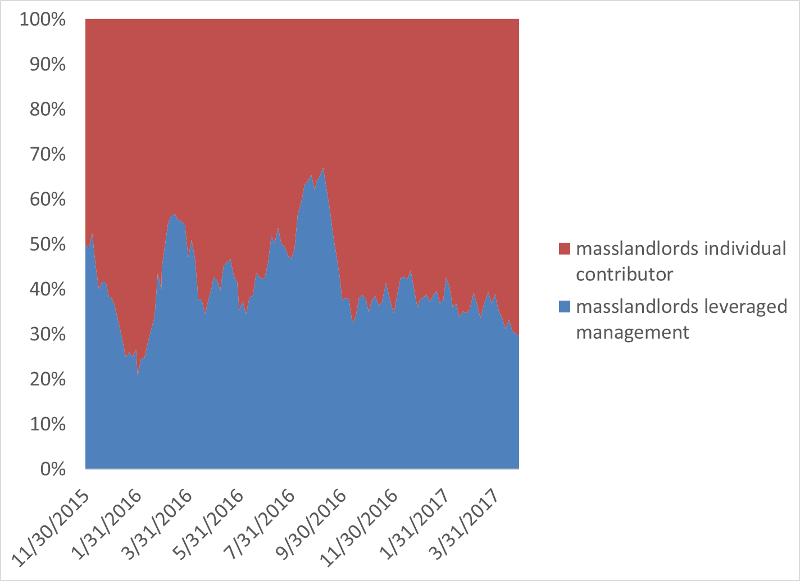 In the last 18 months, MassLandlords has brought on about 50 hours of work each week (one big and several smaller hires). So I somewhat expected that I would add about ten hours of high leveraged work each week and lose a lot of unleveraged work. The red portion of the graph is “individual contributor,” or things that an employee should be hired to do. The new hires are definitely working out, but they are exposing weaknesses in customer service, event logistics, and financial controls. All of these areas are largely my “individual contributor” responsibility. On our bootstrapped trajectory, it has been undesirable to lose touch with our customers by hiring for service, and impossible to hire adequately for logistics or controls (these positions seem to require some degree of scale because of the physical nature of the logistics work, and great degree of trust required to hand over financial controls). The increased effort for event marketing, event planning, and advertising have certainly been helpful, but they are generating more customer interactions, more events, and more transactions. Leveraged management time vs individual contributor time in a bootstrapped startup. Each point is a ten-day moving average of 4-day intervals. The graph showing total hours gives more insight. 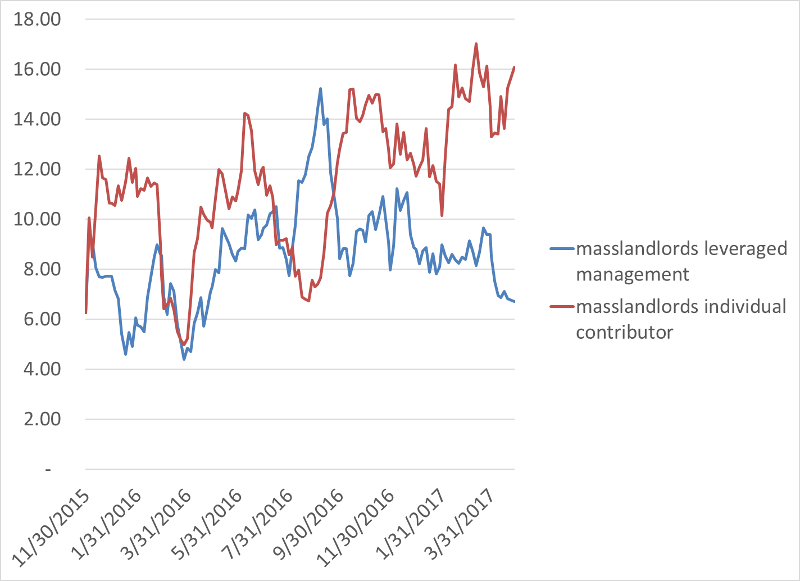 The red “individual contributor” line has been climbing as MassLandlords has grown. Our major hire started fall 2016. During their training, the blue “leveraged management” line spiked. It has been declining as they (and other team members) gain experience and ability. The blue line should have stayed high after that major hire. Except with the weaknesses in service, logistics, and controls, the red line shows a lot has landed back on my plate. This has distracted me from focusing on scaling and the next hire. The trick here seems to be to make sure that some portion of the blue line includes time spent scaling and focusing on the next hire. If that’s the case, then we will eventually successfully pull ourselves up by the bootstraps. On the other hand, if the blue line is being spent just to keep the existing team going, then we must be caught in limbo. Not only will no one be working on scaling, but also, because I am just one person, the red line will eventually max out, customers will go unhappy, churn will increase, and the organization will rebound downward. Understanding this graph is of the first importance. And anyone with a bootstrapped startup probably should be making their own graph, because so much of starting up is “the grind” that produces so little value compared to high-leverage activities. Service: Knowing what I know now, I would have implemented a customer service process much sooner, maybe at the outset. It would have been possible for me to maintain contact with customers even from inside a framework like zendesk. Now we have a situation where customers are emailing the last team email address they saw, which is pretty much not working out for anyone. Logistics: This is a problem particular to MassLandlords, where we basically need to have 23 physical locations one night a month. I don’t think I have any insight to share at this time. So that’s the latest timetracking update on our bootstrapped startup. I see now why people take capital: just go hire all the people you need.